One day, in the not too distant future, the hubby and I will be free of the debts that have plagued us for the last 15 years. Yes, we will at some point experience life after debt! I can barely wait for that day. It’s within reach now and if we work extremely hard, that day could arrive before the year is out! I’m the kind of person who likes to think ahead. Even though we’re not quite out of the woods with our debts, my newly developed ‘personal finance’ radar is already planning for what steps we’ll take next and how we’ll get there. There are two big areas that we need to focus on. One is buying a home for ourselves and the other is to ramp up our financial plans for retirement. This post would be far too long if I went into my thoughts on both these areas, so for today, I’m just writing about property and the impact our debts have had on buying a home in the future. The hubby and I have bought two houses in the past – well, we had mortgages on them at least. We bought a tiny two up, two down for our first property and then upgraded to a three bed family home. Then our debts caught up with us and we relocated to be closer to the hubby’s work. We’ve rented out our former home and the rent covers the interest only mortgage on it with a little extra which we put into our rental emergency fund. We really want to buy our own home where we live now. Here lie the two problems we have about buying a home for ourselves. The first problem is that we already have one mortgage which isn’t getting paid off because it’s interest only. We would struggle to sell our old home right now because of the way the housing market still is here in the UK – we don’t have any equity in it. I guess this property could be an investment for the future but I think we do need to start paying this mortgage off or at least reduce it to the point where we can swap over to repayment and let the rent cover it. The second problem we have is that once we come out of our debt management plan, we’ll have a lot of credit rebuilding to do. Like six years worth. Specifically, it’s my hubby’s credit rating which has been affected because the DMP is in his name. Mine is actually pretty good, but of course we need both of our credit ratings in tip top condition for the future if we are to get a decent mortgage for our own home. From what I’ve read, the best way to do this is to use credit cards to fund small purchases with a view to paying them off in full at the end of the month. Because of poor credit problems, the only cards which will be available to my hubby will be very high interest ones – not that we’re worried about that because there’s no way in the world we’ll be letting our debts get out of control again, ever! During the time we’re rebuilding credit, we need to save, save, save. Not just for retirement but for a hefty deposit on a property too. I think a good approach to achieving our goal of buying a home is to save for three years and raise as large a deposit as possible, whilst rebuilding our credit score and trying to earn more – and then try for a mortgage application. There’s no rule that I’ve read anywhere which states you have to wait for six years before applying for a mortgage despite the hubby’s credit score being affected for that amount of time. I’ve just read that it’s a bit hit and miss. But hey, the larger deposit we can raise, the more chance we’ll have, plus mortgage lenders might be more accepting in a few years time than they are right now with any luck. I love the house we’re renting. but I can’t help feeling like we’re throwing money away each month when it could go towards the mortgage payments for a house instead. Still, we’re in the situation we’re in and we just have to make the best of it. Things could be a lot worse. Being forced to save for longer will mean that we’re in the very best position we can be in for when we’re able to buy a home and it’s kind of reassuring to think that we’ll actually own a good share of our chosen property when that time comes. Unlike when we bought our first house on a 100% mortgage deal. We owned no part of it and we didn’t have the foresight to worry about that back then! 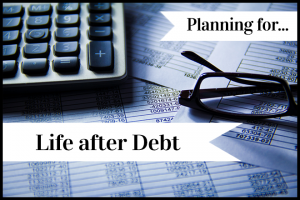 Life after debt won’t be all that different! At the start of this journey, I remember reading someone else’s blog about how they’d finally paid off their debt and instead of feeling happy about it, they felt like not much had changed because they were having to save so hard to make up for the time their debts had swallowed up their income. I understand how this person probably felt now, because on the face of things, not a lot will change. But I definitely do feel happy about the prospect of being debt free at some point! Things can only get better even though we’ll still be saving every penny we can. The difference will be that we’ll have choices about where our money is going and that in itself is pretty fantastic! 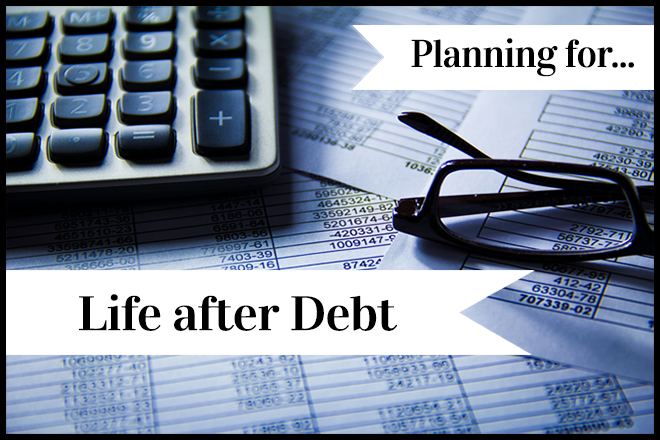 If you’ve already paid your debt off, what were your financial priorities afterwards? One thing I’m afraid of is lifestyle inflation after we get out of debt. Still trying to figure out how to keep that from happening…… Seriously though, it’s awesome that you’re already planning for debt freedom! Thanks! 🙂 Yes, spending more because we’ll have more disposable income is a worry too but I think we’ll be fairly strict with ourselves once we’re debt free. I’ll keep you posted on that though! After I had paid off my debt, we ramped up savings to pad our E-fund. Our goal was to be able to also max out retirement accounts each year and we’re on track to doing so this year. We are also considering buying a condo or small townhome but that is still a couple of years off. Good on you for thinking ahead because that does keep you focused on why you’re working hard to get out of debt now. Wow that’s great that you’ll be able to max out your retirement accounts this year Kassandra! We definitely want to work on our emergency fund too. Just in case something happens that we can’t predict. Buying a home is definitely a future dream of mine – but I don’t think my credit could take it yet. I’m quite contented where I am right now but I think it makes financial sense to eventually buy – and pay off – a property. Having said that, I’m in the UK like you so i know just how darn expensive property is here! Hear hear! It’s really hard to get a decent mortgage right now too. 🙁 It’s good though to have time to save – the more we can save, the less of a mortgage we’ll have to get. Are you trying to improve your credit score at the moment? Having money go towards loans and instead build up in some magical compounding bowl of goodness sounds fantastic, just being able to make that choice will be different. I’m glad your efforts are paying off and you’ll be debt free in no time. I know having high interest credit cards is not ideal, but it’s really not a big deal if you pay them off at the end of the month and don’t pay any interest. You’re still building a credit history without having to pay for interest. So as long as you pay it off before the interest kicks in, you should be fine. Thanks Aldo, that’s how we see it too. They’ll definitely get paid off in full at the end of the month as I’ll set up a full balance payment so that it happens automatically! I think not much will change for us either after we get out of debt, nor do I want it to even though that sounds strange. Let me explain. Once debt is paid we want to save for house renos and then investment retirement savings top up. We also want to live frugally so that our retirement nest egg will last. So there you have it, no change, except for the fact that we won’t have to work once the renos and top up is done. That will be our reward. debs recently posted…Cutting Cable – Will it Payoff? Sounds like a great reward to me Debs. I think carrying on living frugally is the best thing for anyone trying to get out of debt. Once that money towards debts is freed up, it can then be put to good use! So excited for you to become debt free in the near future! I hope you can meet all your new savings goals without having a huge lifestyle inflation. Your plan sounds great! Honestly, I have a feeling not much will change for us, either. We’ll just be saving for other things we’ve put off for now. But at the same time, I would much rather be saving on my own terms – the money is still mine at the end of the day. I can’t say the same for paying off my student loans. Thanks Erin (and it’s so lovely to know your name by the way). Saving on our own terms will be pretty great! We are 2 months away from being debt free and plan on increasing our e-fund first and the retirement. We will need to re-do our monthly budget and increase our spending in some ares that have been cut over the last 4 years. I think the key is to remain focused with a plan, but allow a little more spending on lifestyle. We had a bit of malaise after paying off our debts. I thought it would be a big celebration, but it was more of a relief than anything…and kind of a surreal one. It’s been over a year, and it still doesn’t feel real on some days. Now we just focus on acquiring assets more than paying off debts, and we travel more: another goal we think we ought to address before we get older, have kids, etc. Done by Forty recently posted…Is College Really Getting More Expensive? I know what you mean DB40, I think I’ll feel the same sense of relief! Travelling more is one of my goals too but I think I’ll need to wait until my daughter is a bit older now. I can’t see her wanting to see the cultured sights of Europe just yet. Disneyworld would be more her thing!